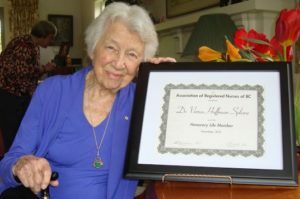 The ARNBC Board presented Verna with an ARNBC Honorary Life Membership at a small ceremony at her home on April 27th 2013. Verna was in good form and it was a lovely opportunity to pay tribute to her contributions to the profession and to acknowledge her great support of ARNBC during our founding years. She is our first Honorary Life Member.